​​The Spill Emergency Big Bag (Spill Kit) is very well suited, just like our Spill Emergency Pallet Box, for the storage of Oil and Chemical Absorbents of all kinds. For example, the type "Water Pollution Control" for stocking Oil Absorbent Booms, Skimmer Pillows and Meltblown Oil Absorbent Pads and Pad Rolls. Stabilizing rods are worked into the Big Bag Spill Kit for easily taking products out of the bag. 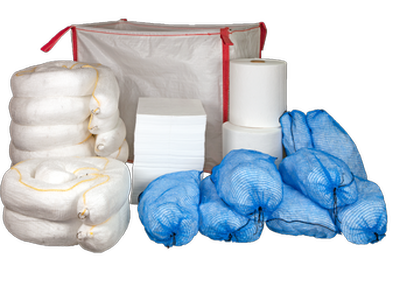 Big Bag Spill Kit is equipped with a PE inliner to protect contents against moisture. A second Big Bag (also with inliner), accompanying the first one, is intended to unproblematically dispose of the contaminated oil sorbent. The Big Bag content is used to quickly contain oil and to remove it on inland waterways. The loops of the Big Bag Spill Kit facilitate its mobile use with a forklift truck. The content of the Spill Kit is suitable for soaking up oil and other hydrocarbon-based liquids. The products are absolutely unsinkable and thereby ideal for use on water surfaces polluted by oil.